Info: Lobsang Tsultrim set himself on fire and proceeded to march along the main road in the upper part of Ngaba county town, shouting slogans of protest against the Chinese government. As he walked on from the site of his self-immolation, armed police personnel came running to intercept him, at which he turned and ran back in the other direction, continuing to shout. He was then knocked to the ground by a police officer, and the police extinguished the flames, and threw him into the back of a pickup vehicle. He was held down by police officers, but was seen to raise his arms while continuing to shout, showing that he was still alive. Lobsang Tsultrim was from the Yeshe Tsang household in Soruma village, Choejema township, Ngaba county. His father’s name is Yeshe and his mother is Tsedron. He was the eldest of four brothers and sisters. 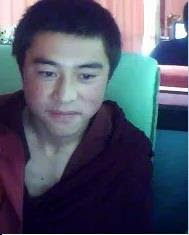 He joined Kirti monastery at the age of eight, and studied at the ‘Buddhist youth academy’ or monastery school. Once that institution was closed down in 2003, he entered the monastery’s Tantric college.